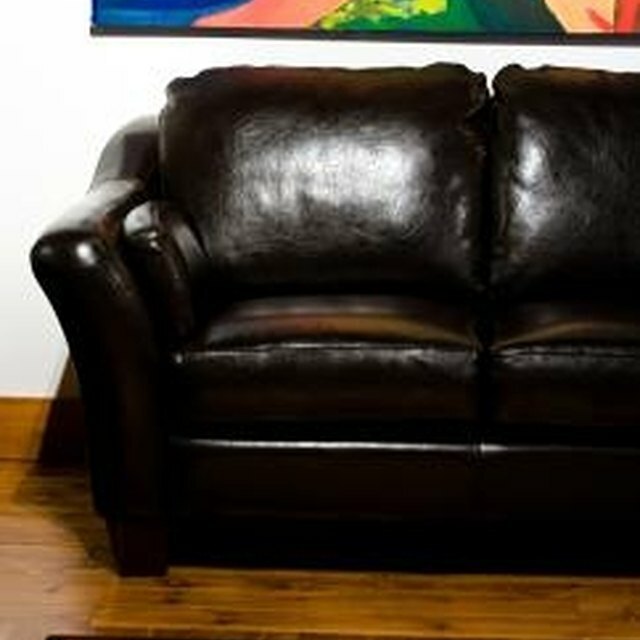 Vinyl furniture is similar to leather furniture in style. It is made to look like leather furniture. Instead of leather made from animal skins, vinyl is polyvinyl chloride; a thermoplastic. Vinyl is durable, yet slightly more fragile than leather. Vinyl furniture rips more easily than leather, and sometimes becomes stained over time if not properly treated. Vinyl can easily be cleaned and maintained like leather, but the cleaning techniques are different. Make dingy vinyl furniture look good again. Mix two caps of detergent into half a bucket of lukewarm water. Go over soiled spots with a rag. Dip the rag into a second bucket that contains clean water. Wring the rag dry, and remove soapy residue from the vinyl. Dry with a clean towel. Apply vinyl furniture cleaner for stubborn ink or dye stains. Put a small amount on a soft, white cloth. Rub the cleaning solution all over the furniture, making sure to clean cracks and crevices. Wipe clean with a clean cloth. Vinyl cleaner works best on light-colored material. Apply vinyl conditioner in sections that appear worn or cracked. Place a small amount on a clean white cloth, and rub into the furniture. Flip the cloth over, and continue wiping the dirt and oil off the furniture. Once the vinyl furniture is completely clean, wipe off any excess conditioner with a clean towel. Repair small rips with a patch repair kit. Remove excess material around the rip or hole. Apply a fitted iron-on patch with the adhesive side down. Iron, and allow the vinyl to cool. Repair large rips with a vinyl repair kit. Weld the vinyl back together with the heat-curing tool that comes with the kit. Follow the kit manufacturer's instructions and take care not to overheat the vinyl. Use a small amount of alcohol on a cotton swab to remove stubborn pen marks. Never use a vinyl conditioner that contains animal fats. Vinyl is porous, like leather, and the appearance dulls easily if overconditioned. How to Remove an Oil Stain from Vinyl Flooring?